With over 3000+ sf of space - there is no limit as to what can be created. Our Space is unique, allowing for multiple activities to co-exist or to be used independently of one another. Our Services include Catering, White Glove Service and Custom Decor. This front space is located upon entering Colony 274. This area can be used for table seating, bar-table and bar-stool seating, coat check, modest gatherings, buffet service, performances or gaming. 3 flat screens and a Pool table that is removable, exist in this space. This Main area includes a complete bar and bar-stool seating, Additional built-in seating is along the wall, with bar-tables and bar-stool seating, that is removable to allow for table seating. 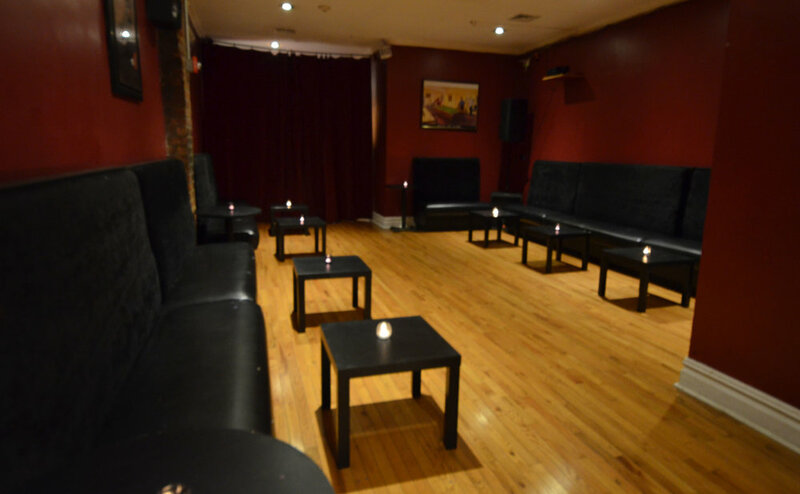 Also included, is a stage for live performances, and a fully equipped DJ booth. Multiple flat-screen monitors and a retractable projection screen along with A/V system. This Back-room area can be customized to suit, private dining or activity space, such as PaintNite or gaming. Events, such as private parties, birthday party, baby showers, children's party, engagement party, weddings, confirmations, communions or bar/bat mitzvah, are well suited for this space. This area also includes a retractable projection screen and A/V.